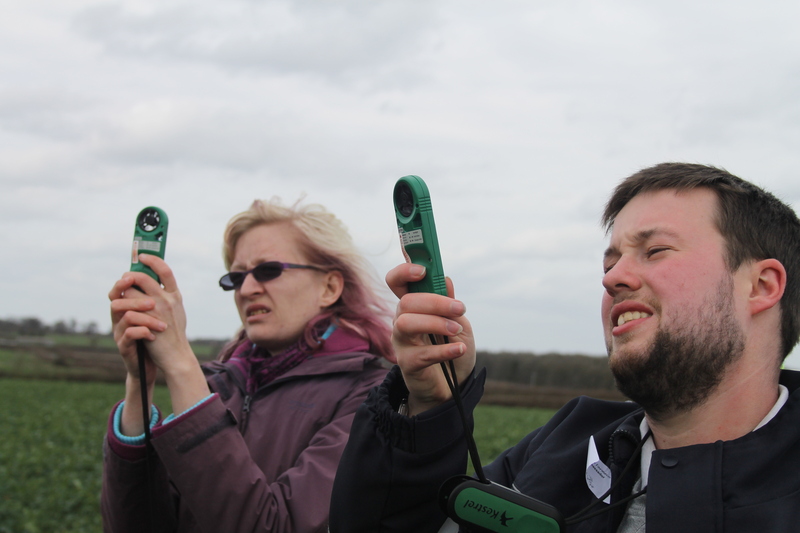 We started the Woodland Trust recording programme today – a programme that is going to see us take monthly readings for the next 25 years. I say “us” but I’m not sure about the chances of me being here in 2040. I’m more likely to be under a tree than measuring one by that time. Despite this, it’s good to think we’re involved in an activity which may persuade people to start more agroforestry schemes. 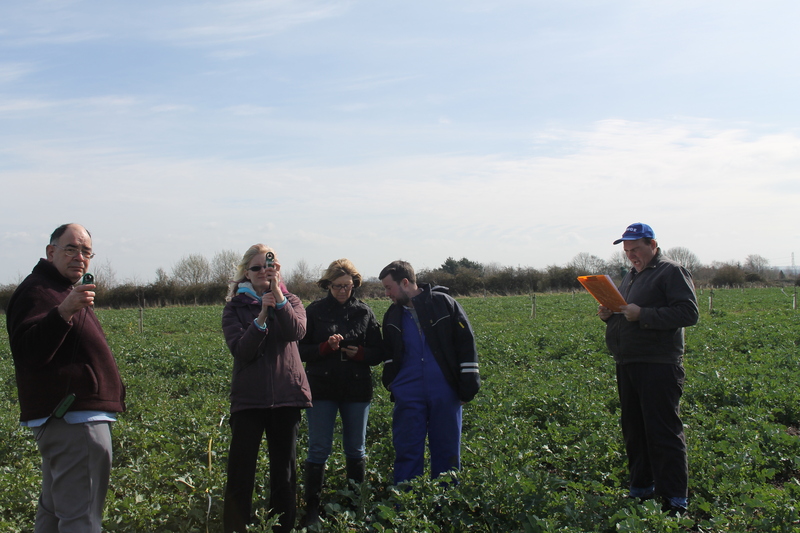 It may never be a mainstream farming technique but even if only a few people do it as a result of our recording it will make it all worthwhile. How often do you get a chance to alter the world? We are measuring wind and temperature data in the fields between the rows of apple trees to see how they modify the climate. It’s not as interesting as measuring the height and spread, but you don’t really need to do that every month. It does you good to think in terms of trees rather than human lifespan. Most of the world’s problems seem to be caused by people who don’t think very far ahead and if we all started planting trees for our grandchildren the world would be a better place. I planted two trees in the garden a few years ago. I’m not really sure how many years, probably about fifteen. I honestly didn’t plan it too well. They were too close to each other and too close the the boundary fence. When I planted them they were about six feet tall and were meant to be trained in a ballerina shape. The neighbour who gave them to me hadn’t pruned them for a couple of years but I was confident I could get them back to form. Lesson One: Overconfidence is not a good thing. Three or four years later, with some lax pruning they were small trees and were growing into each other. As the birds were getting more cherries than we were (one year we literally harvested FOUR cherries) I decided the cherry tree should go. Lesson Two: Try to vsiualise things as they will be in years to come. Finally, with some properly structured pruning, I have a very productive plum tree, which is now the source of a dispute with my neighbours. They don’t like it hanging over their garden and they don’t like the plums dropping off and making a mess. I’d actually left the branches on as I thought they might like a few plums and might think I was tight if I cut the branches back. Seems I was wrong. Lesson Three: A gift of free plums is not always appreciated. 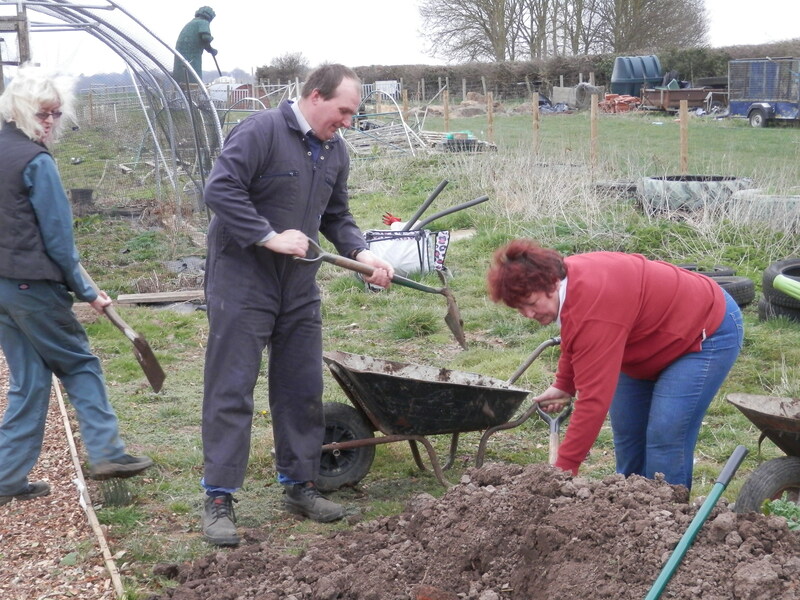 This entry was posted in Care Farm, Permaculture and tagged agroforestry, apple trees, Care Farm, planting trees, plums, trees, Woodland Trust on March 30, 2015 by quercuscommunity. 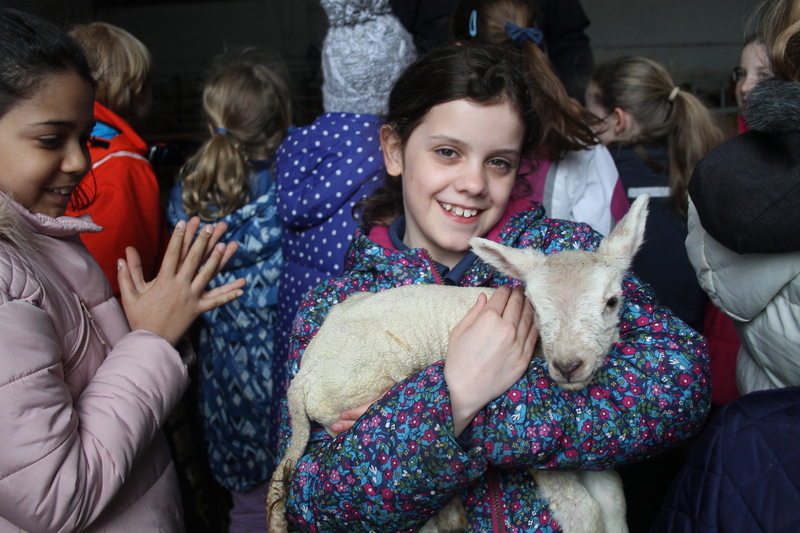 In that time we’ve hosted five school visits, a guide pack (or whatever group they come in), two nursery visits, two college days, two lamb days, an evening meeting, four yoga classes, two baking days, our regular Quercus days, a party and three other events. That’s around 275 individuals, plus the people who came to eat at the cafe. Hopefully they enjoyed themselves and some of them learnt something. Even if they didn’t they did leave us some compost so no visit is wasted. 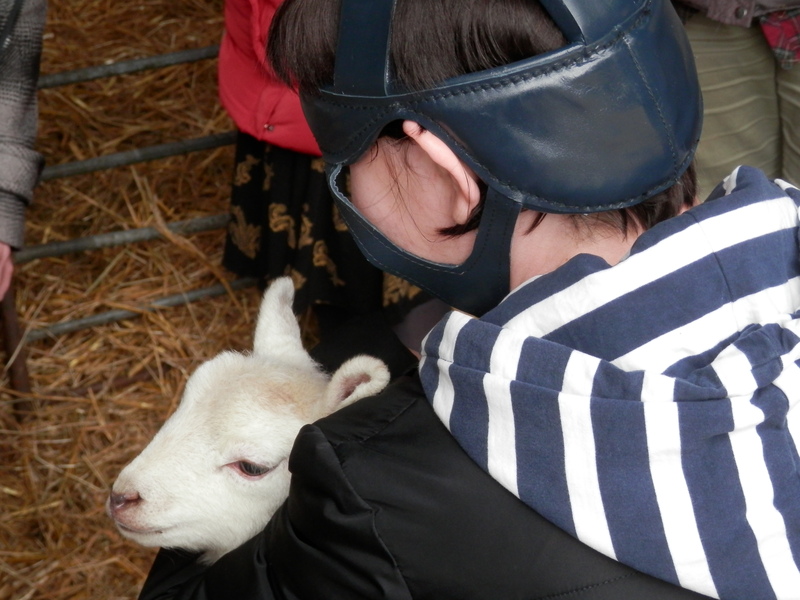 This entry was posted in Education, Green Care and tagged Care Farm, compost, lambing, lambs on March 29, 2015 by quercuscommunity. It’s been a good week for birds, though a poor week for photography means I don’t have much to show for it. I do, however, have a decent shot of the kestrel and two jackdaws on The Neighbours. We’re still waiting for the nest box so I fear we’re going to miss out if we don’t get a move on. Fortunately I borrowed Julia’s camera so I did a bit better than usual. 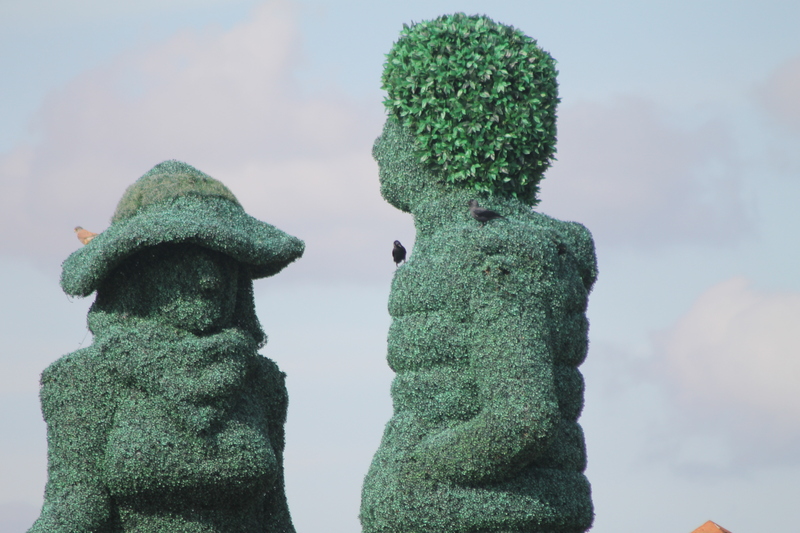 The smaller of The Sweepers appeared in the Nottingham Post today as a reader’s photograph, so it seems like the statues are taking on a life of their own. We had another group out too, for more lamb fondling and such. Julia did a spinning and wool craft workshop to round off the day while I sat down to go through the list of allergens we use in the Saturday Cafe (open 9-1 on Saturday mornings if you are close enough. Don’t stay too long because I have a group of Guides coming down to make nettle soup and soda bread in the afternoon and I don’t want any hold ups. Yes, you’re right, I’m not a natural in the world of hospitality. 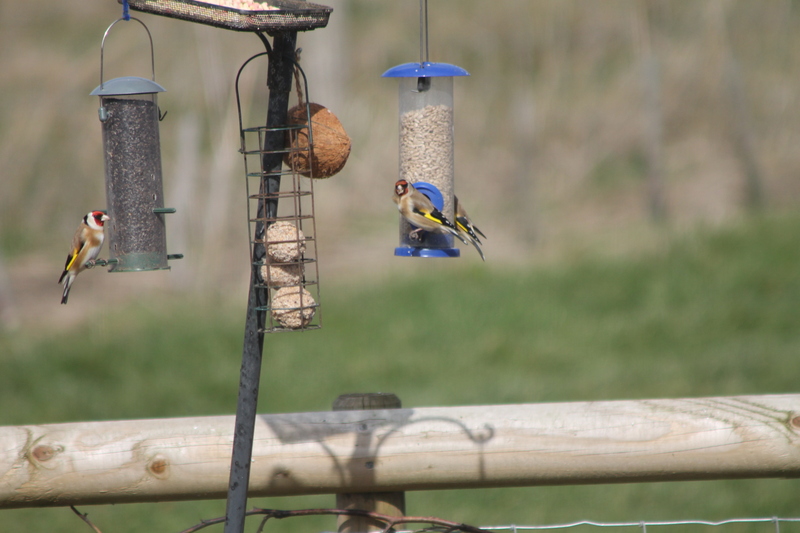 This entry was posted in Care Farm and tagged bird feeder, goats, kestrel, lambs on March 27, 2015 by quercuscommunity. It was raining at 5am, which wasn’t a good sign, and by the time I hauled myself out of bed and headed to the supermarket (sixish) we had a good sized selection of sleet. 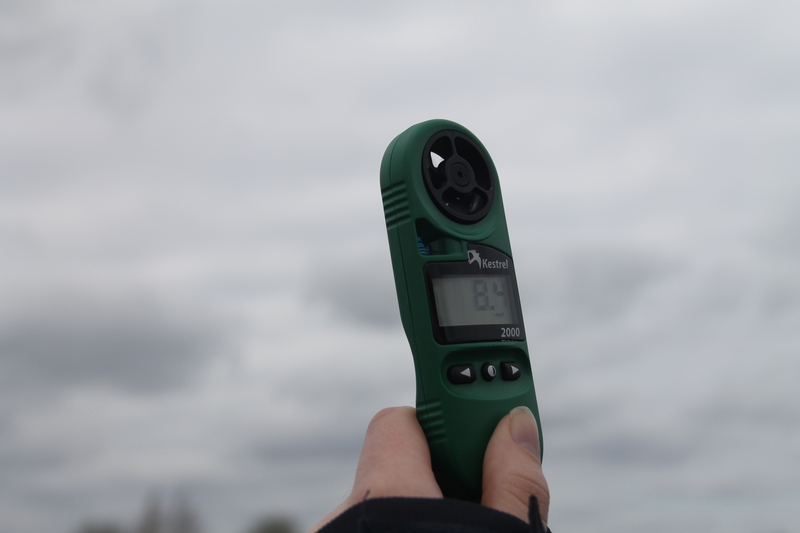 With 32 ten-year-olds coming to the farm for a day of springtime activities this wasn’t a good omen. They don’t, incidentally, call it “geriatric yoga”, they call it “seated yoga”. However, it’s done by geriatrics, so I rest my case. Two pupils decided to reveal they had food allergies five minutes before the start of the session, which was a bit of a downer but apart from that it all went quite well. I’d bought eggs so we could be a bit adventurous and stick eggs on top of the pizzas but as one of the allergies was eggs I decided to give them a miss with the first group. When the second group was offered eggs only one accepted. I worry about modern children. I know we talk of Nature Deficit Disorder but are we also breeding them to have no sense of adventure? 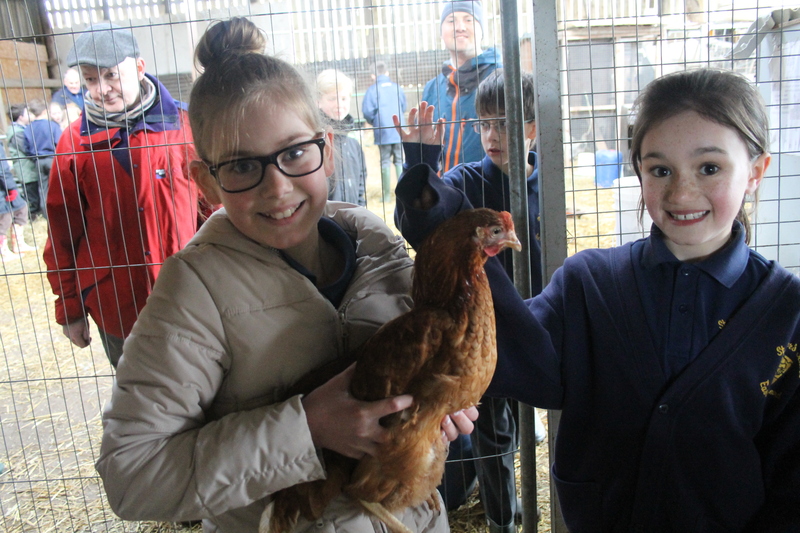 This entry was posted in Care Farm, Education and tagged chickens, lambs, Nature-deficit Disorder, outdoor activities, pizza on March 26, 2015 by quercuscommunity. 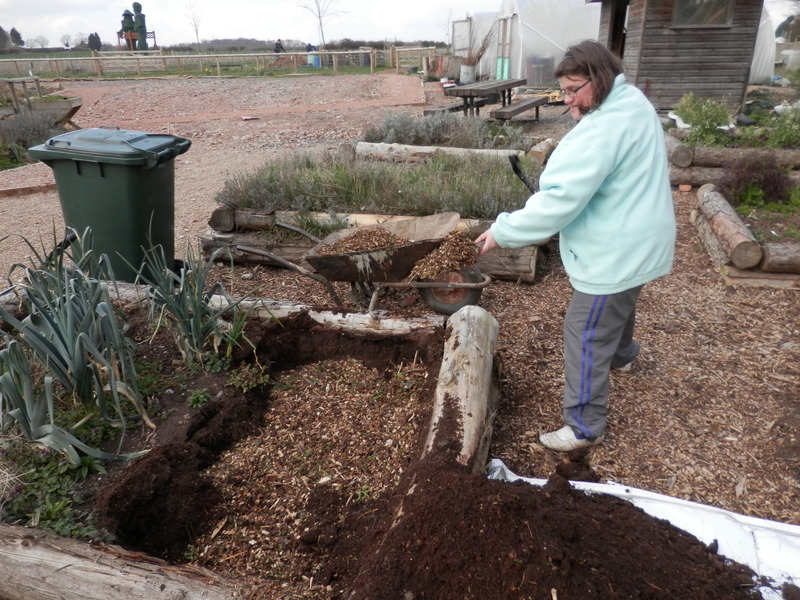 We added the last barrow loads of soil to the bed today and although the central compost basket isn’t quite finished as it should be we’re pretty happy with it. Working on the basis of striking while the iron is hot we have started a second bed using recycled materials to form the boundary. 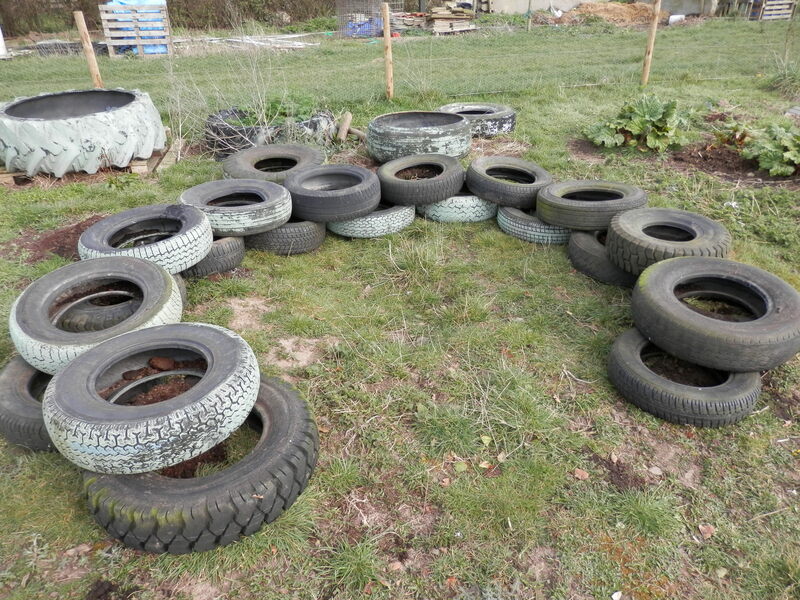 This time it’s old tyres, because we have plenty of them (somebody just dumped another four in one of the fields recently.I’m hoping that the black tyres will heat up in spring and give us a slightly earlier start to the year, though we will have to wait until next spring to test the theory out. We’ve also started a trial in one of the raised beds. They were made from conifers felled during the building of the centre and half filled with a mix of rubble and rubbish from a demolished barn. We used general purpose compost from the local garden supplier (bought by the ton so it wasn’t too expensive) but there isn’t a lot of body in the soil in the beds as you may imagine. Digging holes today it was clear that the top foot of the bed we were working was very dry and though it had roots in it there wasn’t a lot of organic material in it. I spotted three worms, but that isn’t a lot for the soil we shifted. Hopefully we’ve addressed this lack by sticking in a layer of wood chippings, a layer of paper towels, fruit peel, teabags, toast and eggshells. Mainly paper towels to be honest, but we generate a lot of waste on a school visit and we need to reuse them if at all possible. 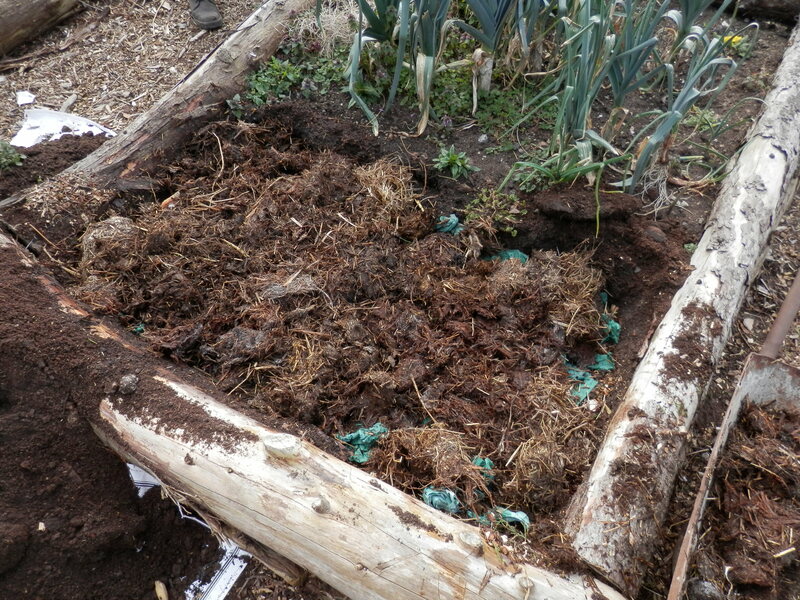 We followed this up with a layer of pig muck and then replaced the soil. 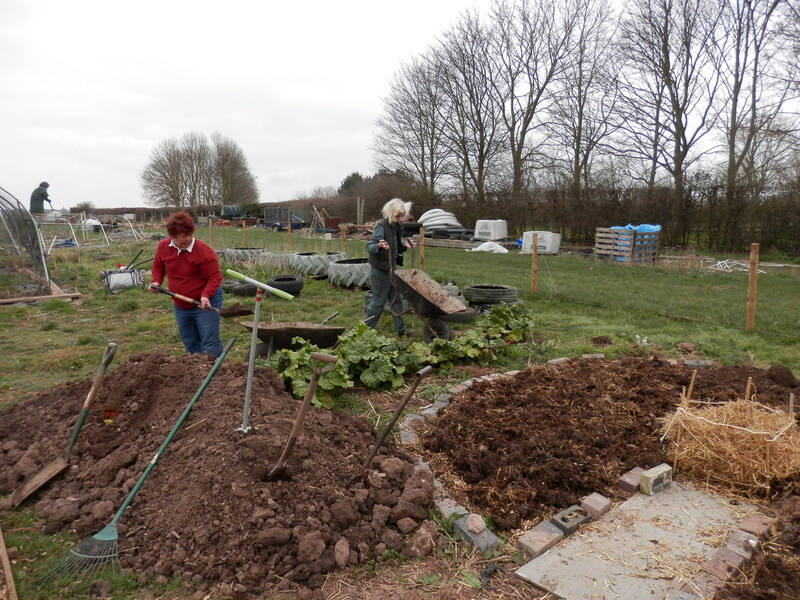 We harvested the leeks this afternoon so next week we’ll repeat the process with the second half of the bed and use the whole bed as a raised bean trench. It’s going to look decorative and hopefully be very productive. 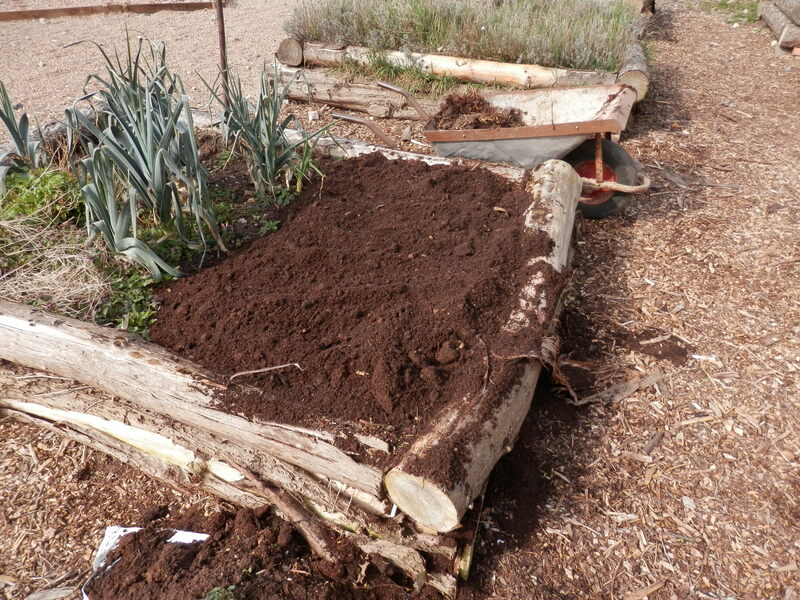 If it works we’ll start a proper rotation and do the same to another bed next year. 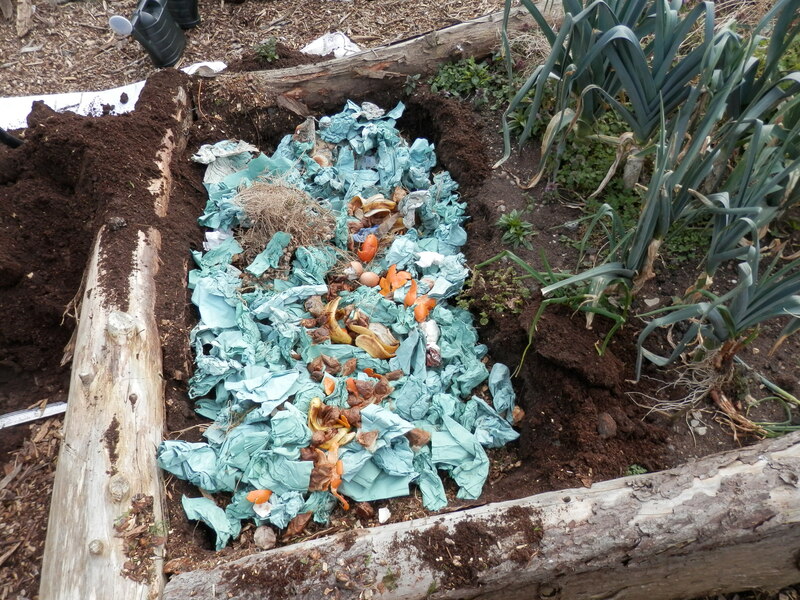 This entry was posted in Gardening and tagged Care Farm, compost, composting, gardening, permaculture, raised beds, worms on March 25, 2015 by quercuscommunity. 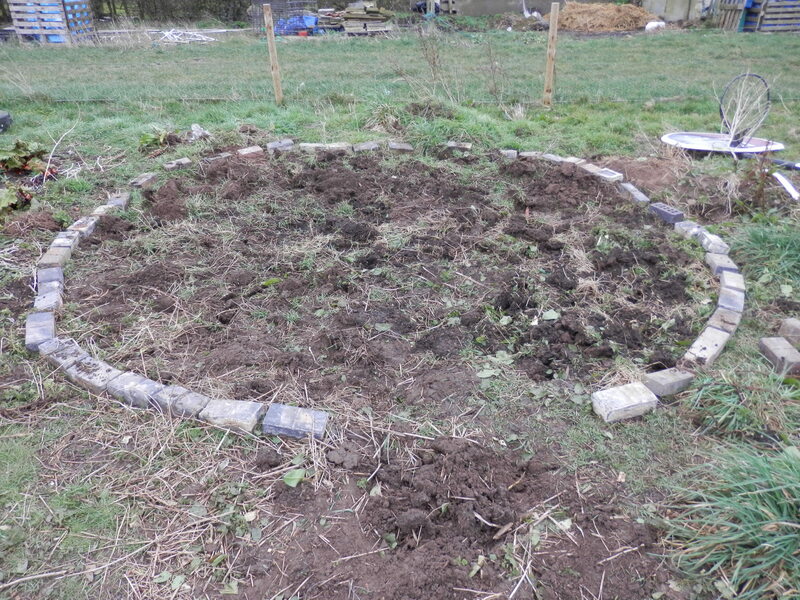 After six months of discussion (the “we should build a keyhole garden” phase) and three more of procrastination (one of my better developed skills) we eventually entered the final phase of pre-building – the “do a few hours and then stop” phase. We’ve had a circle of bricks and roughly chopped earth waiting for us for a bout a month now, but with trees and lambs and such we haven’t had time to get on with it. 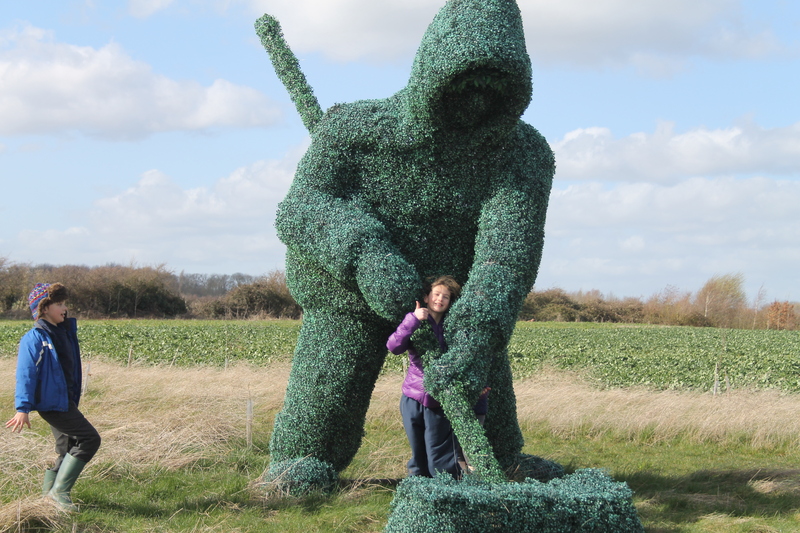 At the weekend we decided we needed to start work again. There’s frost forecast for next weekend, and that’s just what we need to break up some of the lumpier bits. If that isn’t enough there’s a whole list of other reasosn to get on with it – planting time coming up, the need to focus and the upcoming “Kenya Day” we’re having. You will search in vail for any Kenyan National Holiday on 9th May, we just seem to have chosen 9th May as a convenient day. I’m not sure what is being organised because I’m trying to avoid adding to my workload, but it’s pretty certainly going to involve a reduction in the goat population round here. What? You didn’t think we were rearing goats for fun did you? Farmers, as we always tell the kids coming round, don’t keep pets. From the top left – The Start,. 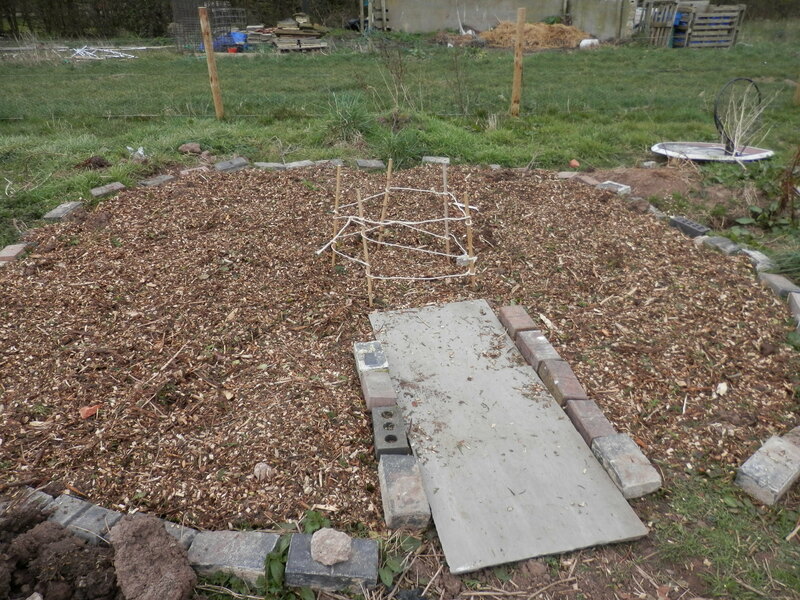 The next phase with drainage layer, keyhole and wood chippings applied and the compost cage in place. 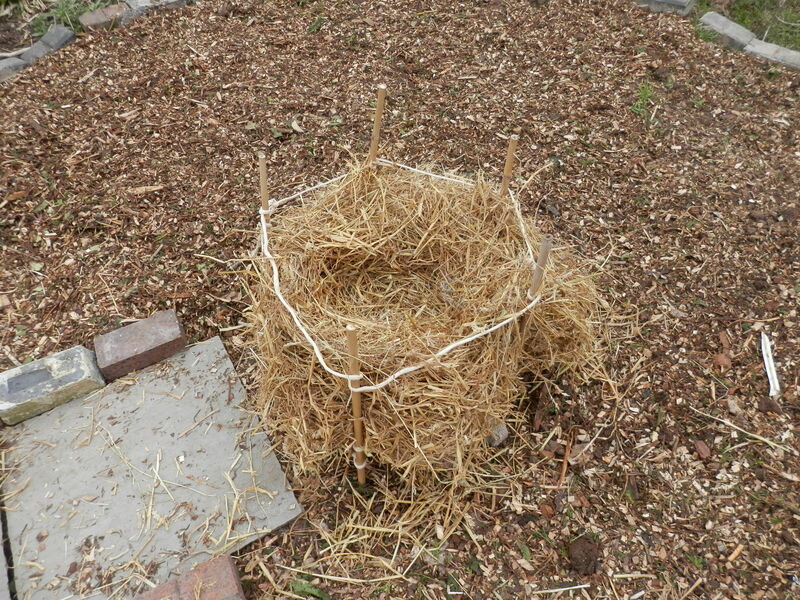 The compost cage lined with straw. My hard working staff starting to put soil on the layer of well-rotted pig manure. Close up of hard working staff, who by that time were starting to abuse the photographer and talk of tea. 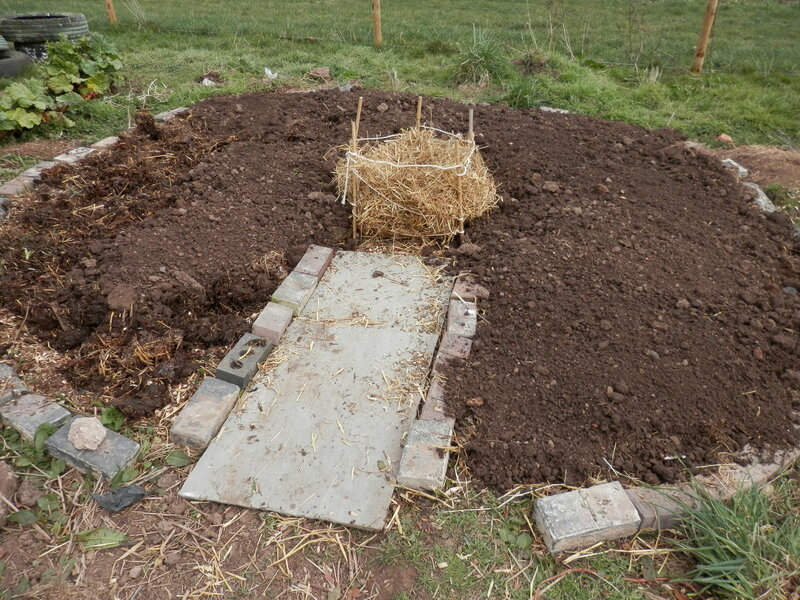 Final shot – most of the soil is in place – probably six to eight barrow loads for me and Julia to apply tomorrow and then we just have to let it settle for a while. The theory is that you put compost in the central cage and water it, thus getting best value out of the water and the nutrients. Some beds are much more like raised beds but the bricks we had earmarked for the job ended up in a path so we’re having to make do with a lower wall. Despite this we will be getting an increase in surface area because of the slope. There are all sorts of keyhole beds, as you can see if you follow this link. This entry was posted in Composting, Gardening, Permaculture and tagged Care Farm, compost, composting, gardening, permaculture, sustainability on March 23, 2015 by quercuscommunity. The threatened children arrived, took the farm by storm, had nettle soup (in large quantity in one case), thoroughly enjoyed themselves and then left. The floors are actually looking cleaner than when I arrived to set up, thanks to parental input. Despite the noise and squeakiness and jollity I actually quite enjoyed it, though I am grateful to my kids for taking up martial arts and rugby rather than going to parties. 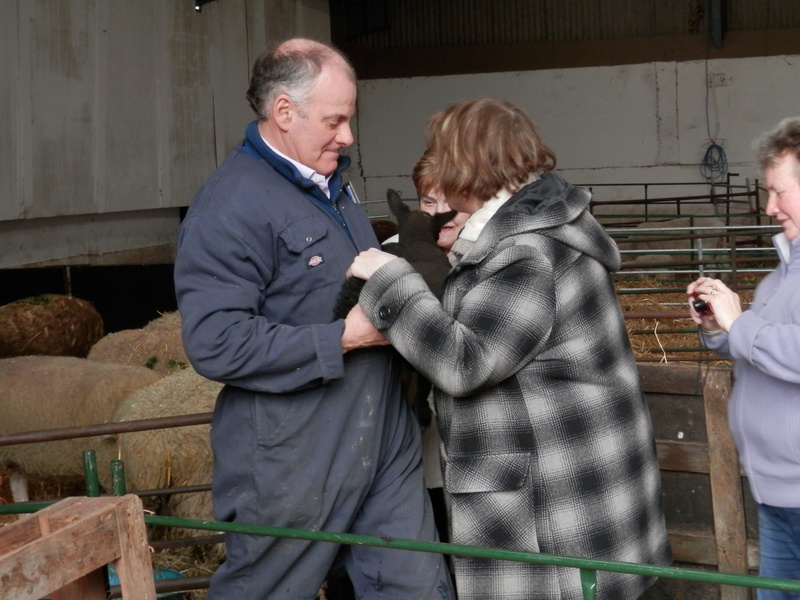 I was also able to take money off four passing ramblers and give out a number of leaflets for Julia’s Easter Event (biscuit making and Woodland Treasure Hunt). If you’re about on Tuesday 7th April it’s 10.30 – 3.00, ages 5-11 and £7.50 per child including ingredients and chocolate. Bring wellies and a packed lunch. Sadly many of my readers come from a long way away but if you don’t ask you don’t get. 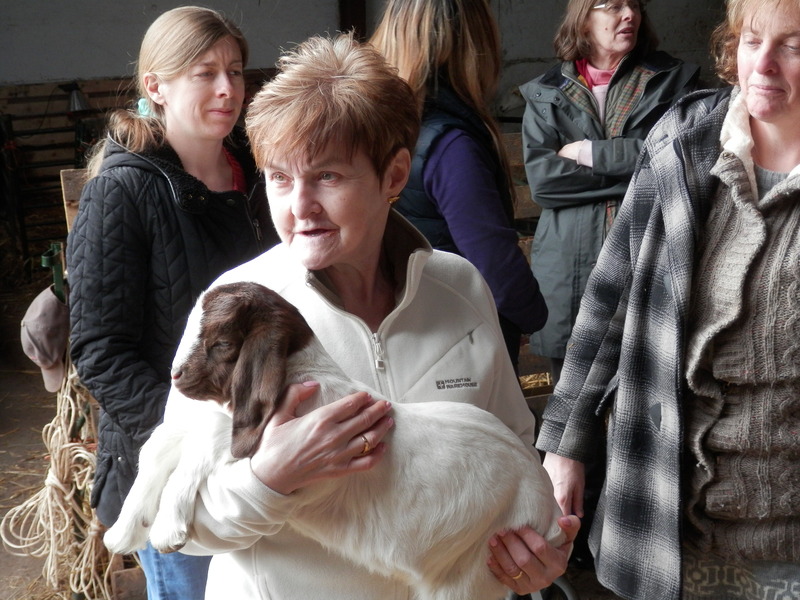 We also had a visit from the Goat Lady, who was much cheerier and less bearded than the name suggests. 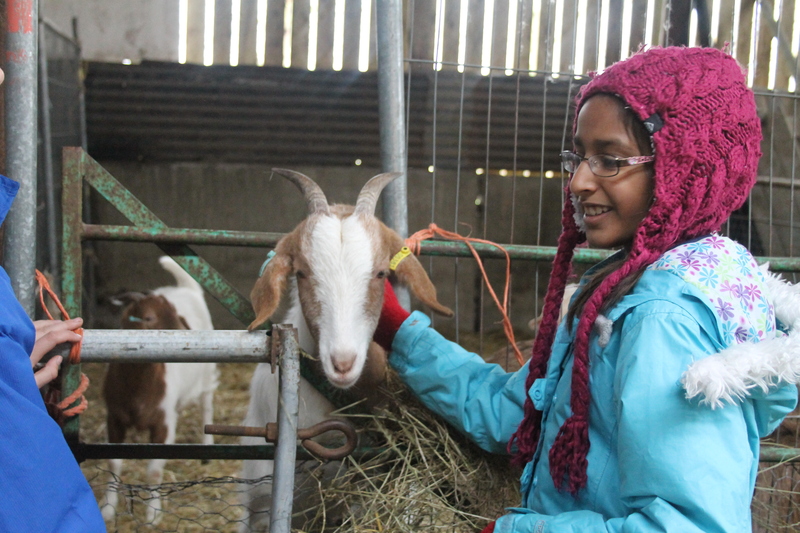 She’s generally happy about the goats so we must be doing something right. All in all, a happy end to the week. 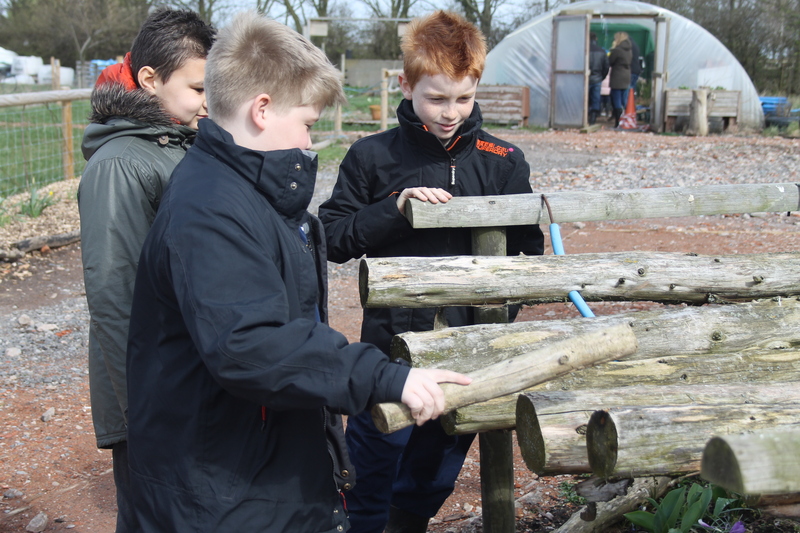 This entry was posted in Countryside and tagged Education, home-made soup, lambs, nettles on March 21, 2015 by quercuscommunity.